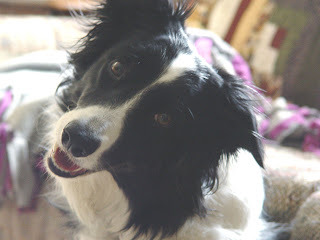 Misty's Musings: Who Says Dogs Can't Talk??? My Molly-Collie is very vocal. I love when she starts 'talking' to me to get my attention. However, there have been a few times that she has REALLY got my attention with her 'talking'. This is because she seems to be answering with the proper human words! I know, you are all sitting there shaking your head and thinking "Here's Misty trying to prove how smart her dogs are again." So, I'll give you some examples, and you can come to your own conclusions. One day, I was sitting at one of our desktop computers, and my husband was at the other computer. Molly came into the room and sat down next to my husband. She reached up and put her paw on his lap to get his attention. My husband looked down at her and said "May I help you?" Molly proceeded to take her paw away, lay down on the floor, heave a big sigh and respond "Nnnnno"
Just the other day, the dogs were outside enjoying the nice weather. My husband was coming inside, so he let Molly come in to see me. I was doing coding work at the computer, so I said Hi to Molly and told her that Mommy was working. My husband came in the office and saw that I was working, so he looked at Molly and said "Mommy is working. So, you are going to have to lie down and be a good girl." Molly proceeded to lie down, as she looked at my husband and made a sound that sounded exactly like "I Knnnnnowwwwww" My husband and I both burst out laughing and my husband said "Yeah well, I know too!" She made this same "I knowwwwww" sound again about two days later when I was outside petting the dogs. I informed them that they were very spoiled rotten babies and Molly proceeded to respond with her "I knowwwwwww" reply. My cat Ricky says "Mom," usually in a very mournful manner when I haven't come out of the bedroom when he wants me. I never wanted to call myself mom for the cats, but he named me! Freddy Cat says "now" quite a lot. Usually when he's bored & wants someone to play with him now! Sam doesn't say any words, but boy can he tell you when he's disgusted with you! He'll huff & shake his head. My dog doesn't "talk", but she has a certain knack of letting you know exactly what she wants by her body language. It amazes me sometimes how she is able to get her point across so clearly just by her actions...and by making sure no one ignores her! Aren't dogs amazing? Mine do stuff like that, too. Melts my heart! Not convinced myself but a fab post. When our Danes "speak" it's like a scene from Jurrasic Park!